All part of my goal to photograph everything sitting on a saguaro, although in truth I never expected to see anything but birds on them given the sharp spines. Early one morning I came across two desert cottontails feeding near a large saguaro shortly before the sun rose high enough to illuminate the desert floor. I noticed this one kept sniffing the base of the cactus and jumping onto it where there were no spines. I got lucky when the rabbit jumped up one last time right as the sun fell upon us, as it only stayed for a moment before the pair hopped off into the shadows and out of sight. 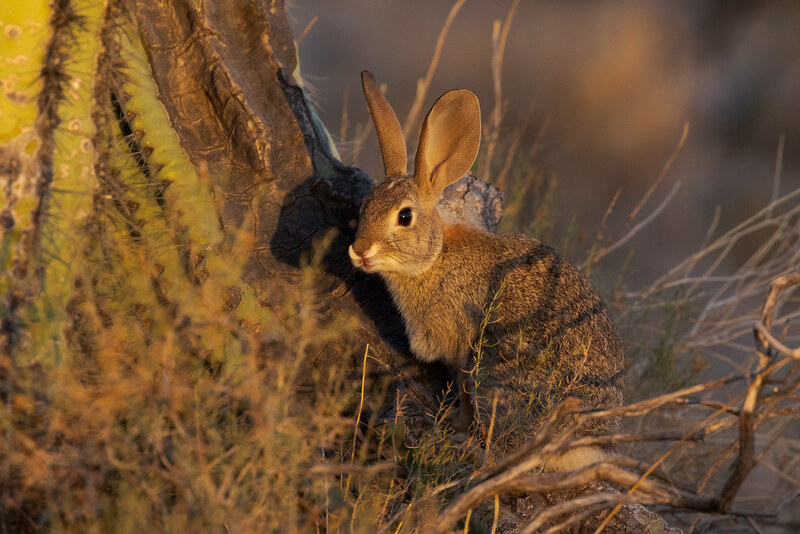 This entry was posted in Mammals and tagged Arizona, Brown's Ranch, cactus, desert, desert cottontail, McDowell Sonoran Preserve, rabbit, saguaro, Scottsdale, Sonoran Desert. Bookmark the permalink.